What’s the Right Pet Fish for Me? Fish make fabulous pets, especially for those who want to have an animal companion in the home. They’re good for people with allergies or those who don’t want to take on the responsibility of caring for mammals or birds. Most likely you are reading this article because you have little experience with aquatic animals or you’ve never taken care of one before. If you don’t want to get the popular goldfish variety, there are other genera and species of fish that are perfect for the beginner. Many species of fish can eat almost anything but it’s best to buy the food that is commercially prepared for each variety. It doesn’t usually cost a lot and the food will last you a very long time. It is possible to overfeed fish. They can get gassy and bloated if fed too much. Additionally, uneaten food will allow bacteria to thrive in the water. Following directions on the label of the fish food is important to maximize their lifespans. Buying a tank of the appropriate size is always preferable over a fish bowl which is too small and doesn’t allow the fish enough room to swim. It may look cute on your table top, but it won’t be a suitable home for even one fish. You may need a filter for your tank but a hanging filter is adequate as long as the tank isn’t too big and you don’t have too many fish. Warm water fish should be kept at about 75°F. If you don’t think your environment will be warm enough, you can buy a very inexpensive heating apparatus that goes right inside the tank. 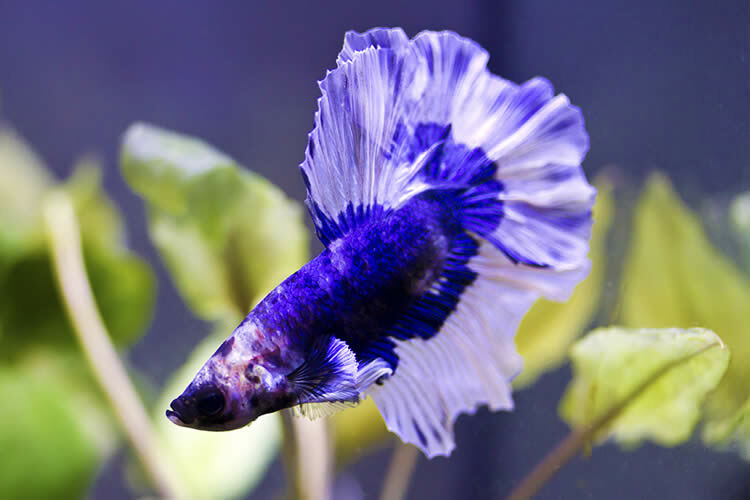 The best known betta species, the “Siamese fighting fish,” is a colorful variety. Hues range from deep blue to bright red. The males are known for their billowy, diaphanous fins and tails – which have earned them the informal name of a “veiltail.” The females can be just as colorful but their accoutrements are not as attractive as their male counterparts. The lifespan of bettas is said to be 3-5 years in captivity but, in my experience, it has been closer to 3 years. Their temperament requires a betta to be kept alone in the fish tank. Thus, they are a wonderful choice for beginners who do not want to start out with more than one fish. Bettas are notorious for fighting with other fish. Even a male and female betta should not be kept together; they will eventually try to fight each other to the death. A modest-sized tank is adequate for them but be sure to have some plants or ornaments where they can hide. The ornaments should not have any sharp edges because their delicate fins and tails can get torn. They like to hide in little dark places so finding a suitable ornament or plant will make your betta’s life much more enjoyable for him. The black molly fish, unlike the betta, is a get-along guy. He can live in the same tank as other peace-loving fish; he’s ideal for those who would like to have a couple of fish or more. Remember, though, the more fish you have in one tank, the more maintenance you will need to do. Also, multiple fish require more expensive equipment such as a good air filter and pump. Black mollies require more space than a betta so buying a larger tank with live plants may be necessary. While you may not need an expensive filter, you should buy one that hangs on the back of the tank. They feed at the surface so any food you give them should be light enough to float. Although you should feed them commercially prepared flake food, you can give them bits of plant matter too. As omnivores, they eat invertebrates such as worms which go into the manufacture of flake food. The reason why goldffish remain so popular is because they are easy to care for. If you only have one or two, they don’t require expensive tanks or fancy filters. While the most identifiable goldfish is a reddish-gold hue, they come in a variety of colors. Their lifespan can be 10years or more but don’t fret if your fish dies well before that. It’s hard to discern where the fish are coming from. If they weren’t taken care of properly before reaching your home, their lifespan may have been shortened irreversibly. Gold fish are easy to keep as pets but they shouldn’t be touched or handled by human hands. In fact, touching them will remove a protective film from their bodies which can be harmful to their health. Sometimes this can be an issue when you need to clean their tanks. Fortunately, many articles and videos are on the web instructing people how to clean their fish tanks without disturbing the fish too much. So named because of their crimson fins in stark contrast to their silvery bodies, these fish are quite social. Consequently they will need to be grouped with other friendly fish. Since they love swimming and playing, their tank size should allow them and their friends enough room to gallivant. In terms of health, they win the Darwin’s Choice Award for robustness; they commonly live 10 years or longer in captivity. Because tetras need to have the company of other fish, you’ll probably need a more expensive filter and more frequent tank cleanings. If you are set on acquiring a few fish, then the tetra remains one of the low-maintenance varieties. However, if the work required sounds a bit too much for you, then stick with the goldfish or betta varieties. Whichever variety you choose, fish are lucky in many cultures. In China, they symbolize unity, fidelity, abundance, and wealth. They keep you company and make your home a bit cheerier. If you need to take a vacation, a neighbor or friend will be able to take care of them quite easily. As long as you take care of them well, they will give you years of pleasure! Can Goldfish See in the Dark? Why Does My Cat Lick Plastic?